Chicken is so often an underrated beast in the food world. When you have no idea what to cook the default is often chicken and there is that response to anything you can’t place taste wise of “well it sort of tastes like chicken”. This (at best) gives the impression of something not unpleasant but otherwise nondescript in nature, but in reality chicken can be wondrous stuff which lends itself to so many flavours and flavour combination. Think Indian or Thai curries, all manner of Chinese dishes, a lovely roasted chicken and (one of my own personal favourites) fried chicken. Moist, tender and most importantly tasty chicken encased in a crisp coating is glorious when done properly and downright awful when it isn’t (you all know what chain I am talking about here ). 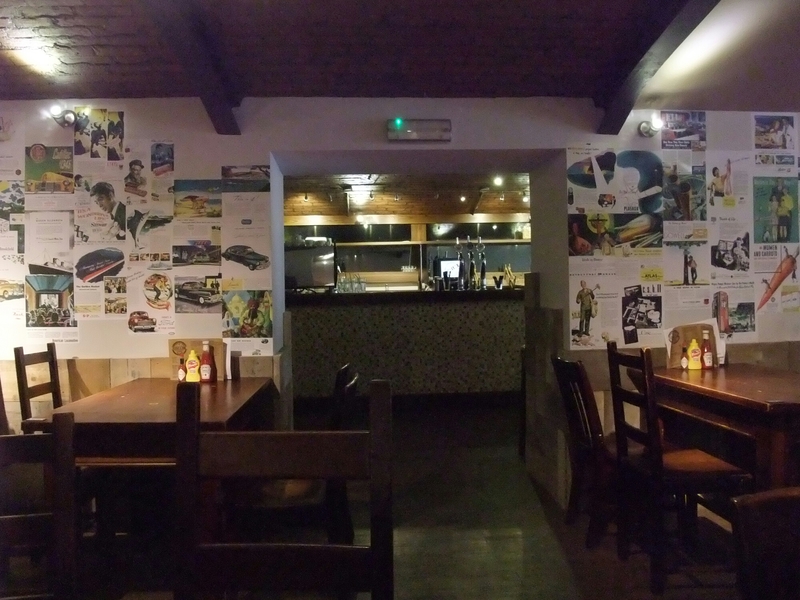 So when I spied on twitter that Pica Pica (a Spanish tapas and cocktail bar in Cardiff) had changed its name to Feather & Bone Bar N’ Grill and would be reopening, in a rather radical change of direction, as a fried chicken, ribs and burgers joint, I have to say my first thought was “well that’s a bit odd”. Spanish to Southern USA staples is not really a natural progression. TexMex maybe but not BBQ, burgers and fried chicken. 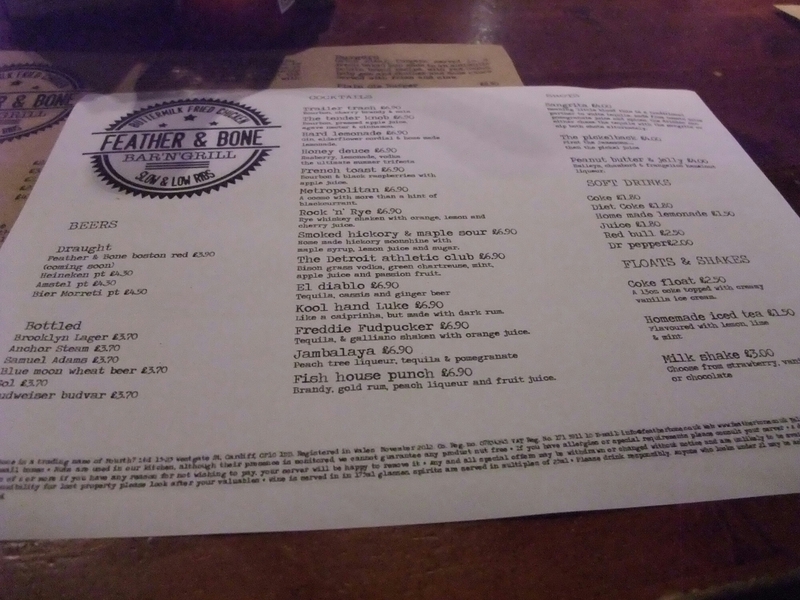 My second thought was “is this a case of jumping on the BBQ bandwagon in Cardiff” (currently being led so admirably by Hangfire Smokehouse ), but I was intrigued by the reference on their menu to buttermilk fried chicken. Cardiff doesn’t (as far as I am aware) have anywhere that does decent fried chicken (if there is, please let me know), so if the stuff here was any good it would be a real find. So when a work colleague was feeling a bit down (having been working her fingers to the bone for far too long) I suggested that the team all went out for lunch to cheer her up. Oh so predictably and with no little amount of irony, an urgent job (in her rather bespoke area so we couldn’t help) came in and as a result she was too busy to make lunch. 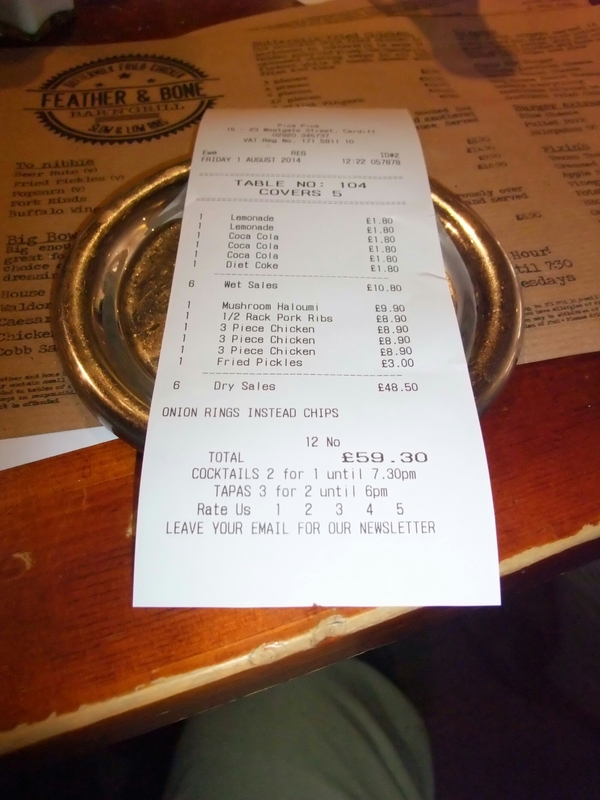 All feeling rather guilty (but not enough not to eat – we did bring her back some fried chicken because we’re nice like that although I made sure it wasn’t off my plate) we trundled off to the top end of Westgate Street where the Feather & Bone Bar N’Grill is located. As up to 8 of us were originally intending on going (this due to work commitments was whittled down to 5) I thought it best to book a table. This turned out to be easier said than done. I called the number on their Facebook page 3 times but each time it went to voicemail. I tried to email (using the address on their Facebook page) but got return messages stating there was no such email address. 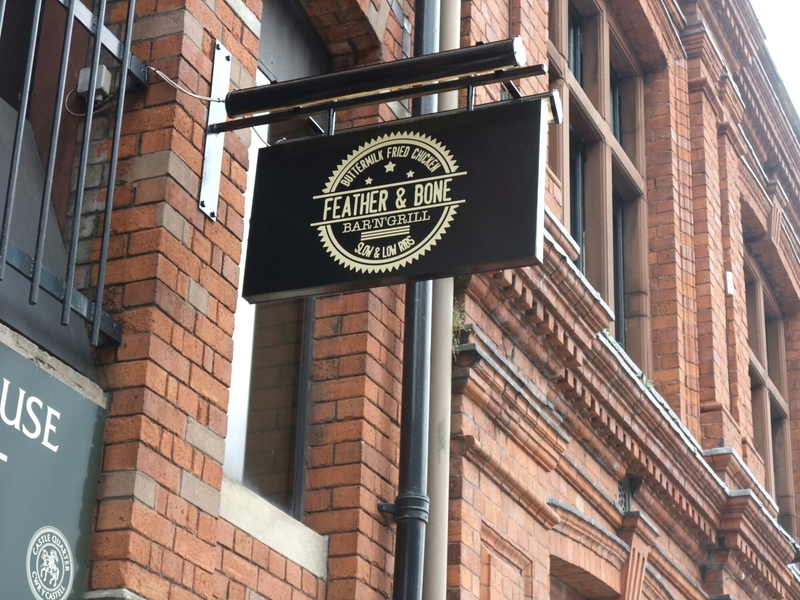 Rather bizarrely I then get a message on my work email from Feather & Bone (a good 4 hours after the time I had asked in my email to book the table for) saying sorry about the phone, had I used their office number (I hadn’t), but table all booked. As it was 4 hours after the requested booking time, unless I had a Tardis to hand this wasn’t really a very helpful communication. Being incommunicado (a colleague who went the day before had similar problems booking a table) really isn’t a good idea when trying to get a new menu/concept off the ground and we very nearly went elsewhere as a result. Teething problems no doubt, but this is a relaunch not a wholly new venture. When we walked into the place there was no one in sight at all at the bar or serving tables. We found a table and only after wandering around a bit did I eventually locate someone. This person appeared to be the only member of staff working that shift and I wouldn’t be surprised if she was actually also doing the cooking. Bearing in mind it was just her she did a sterling job. Whilst it wasn’t that busy, she really needed some help. The place looks pretty much exactly the same as I remember it when it was Pica Pica. The only additions seem to be a new Feather & Bone sign out front and some Americana posters on the walls inside. It still smelt (as was always the case with Pica Pica) ever so slightly (and a lot in the toilets) of damp and this is something that really needs sorting. I notice on one of the pictures on their Facebook page what looked like a air-conditioning unit, so hopefully the sorting of this issue is already in hand. So, after a bit of a moan, to the main event the food. I ordered 3 pieces of fried chicken (£8.90) which came with skinny fries and an apple slaw in the price. What arrived was 3 decent sized chunks of moist and tender (the buttermilk having done its job) chicken encased in a lovely, light and crispy spicey coating. I could have eaten the proverbial bucket load of these. My only criticism of the chicken was it was all breast meat and not on the bone. 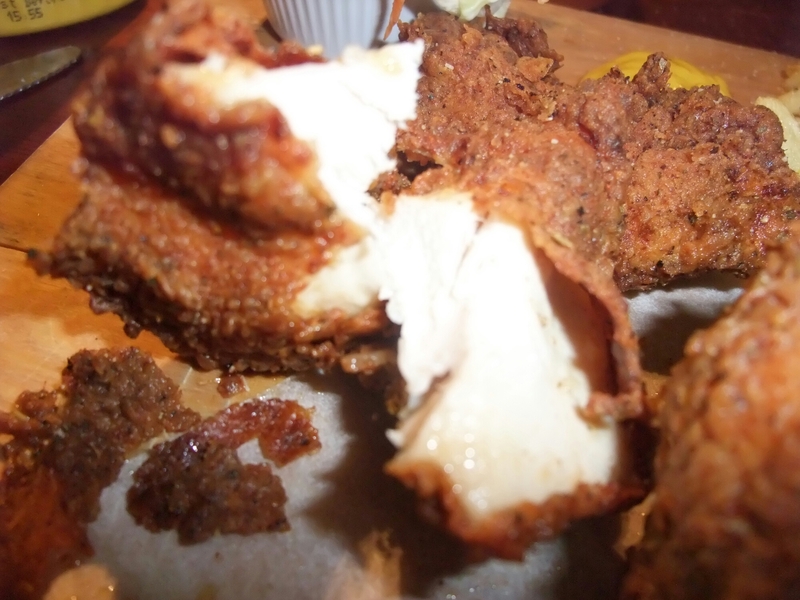 I am more a thigh than breast man (I am talking about fried chicken, people) and would have liked a bone to gnaw on. The bone would also have imparted a bit more flavour to the chicken. On querying the lack of bones we were told by the multi tasking waitress, bar person, chef etc. that they normal give a mix of breast, thigh and leg meat all on the bone but had no whole chickens that day. For a fried chicken restaurant on a Friday I found this more than a bit odd. The apple slaw was OK if a tad too rich and creamy (even with the apple) for my taste. My fries were a bit of a let down. I had to wait a bit longer for my food than most on the table, with the bar person, waitress, chef etc. informing us that the delay in a couple of meals was due to them (her?) waiting for the next batch of fries to cook. They didn’t wait long enough, unfortunately, as they were pallid, floppy and oily when they arrived. Others on the table had more luck with better done and less oily fries. I ate some off another plate (well an annoying board actually, grrr) and they were certainly a lot better than mine, so maybe I was just unlucky. Whilst most of the table had the fried chicken, two people ordered a veggie burger and the half rack of pork ribs respectively. The burger was pronounced as OK by the veggie on the table, but to me the bun looked over toasted (verging on the burnt) and the burger, in the form of a field mushroom and a couple of slices of halloumi cheese, looked a very mean portion. This for £9.90 (with fries and slaw) was not in my view good value at all as against the chicken and indeed the rest of the menu. This pricing seemed too high to me and a bit unfair to veggies. I didn’t try the ribs (£8.90 for a half rack), but they seemed to lack the coating of good smoked dry rub ribs or otherwise the necessary amount of BBQ sauce. As such, whilst the chap who ordered them said he enjoyed them, to me they fell between two stools. We ordered for the table to share (I eat most of these if am honest) a couple of sides. 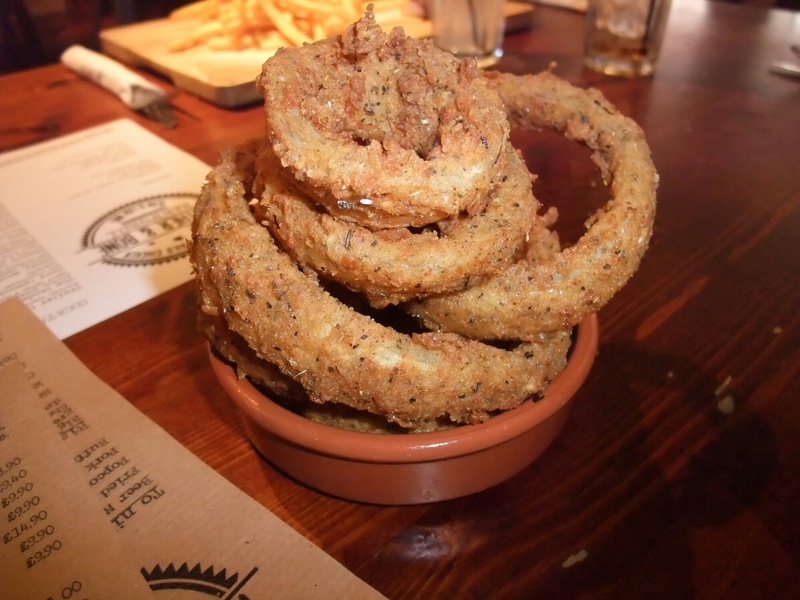 The onion rings (£3 – they agreed to swap one portion of fries that usually came with the mains for these so no extra charge was made for them on the bill – good flexible service that) were exemplary with a lovely light crisp coating. Actually some of the best I have had. Deep fried pickles (£3) were also very good. They were whole, rather than the usual sliced or cubed, coated in the same lovely thin coating as the onion rings. 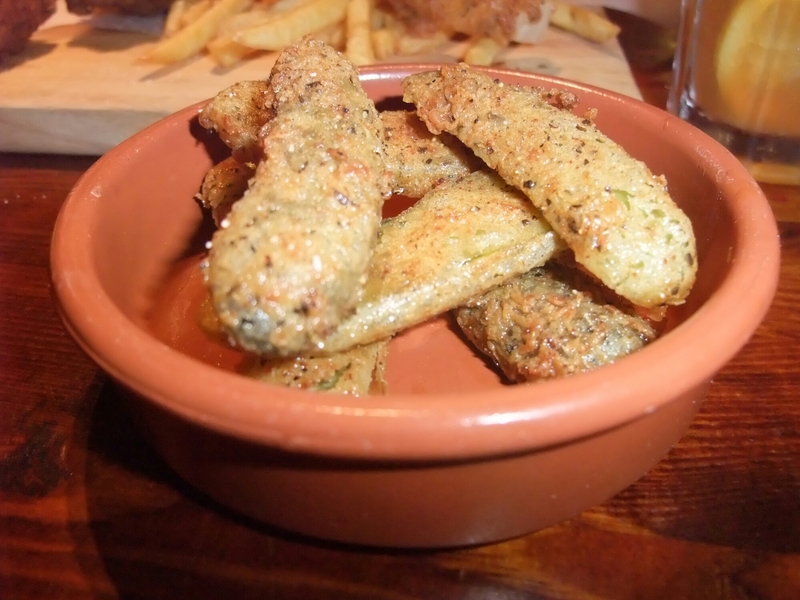 The briny tartness of the whole pickles as against the spicy thin coating worked really well and they were better than both the MEAT Market and Urban Tap House versions in my opinion (praise indeed). Be warned the fact they are whole means you get a jet of hot tart brine when biting into them. All the main dishes came on wooden boards, which I just don’t like. I don’t see how you can put them in a dishwasher so are they properly cleaned after use? The sooner this fad ends the better. 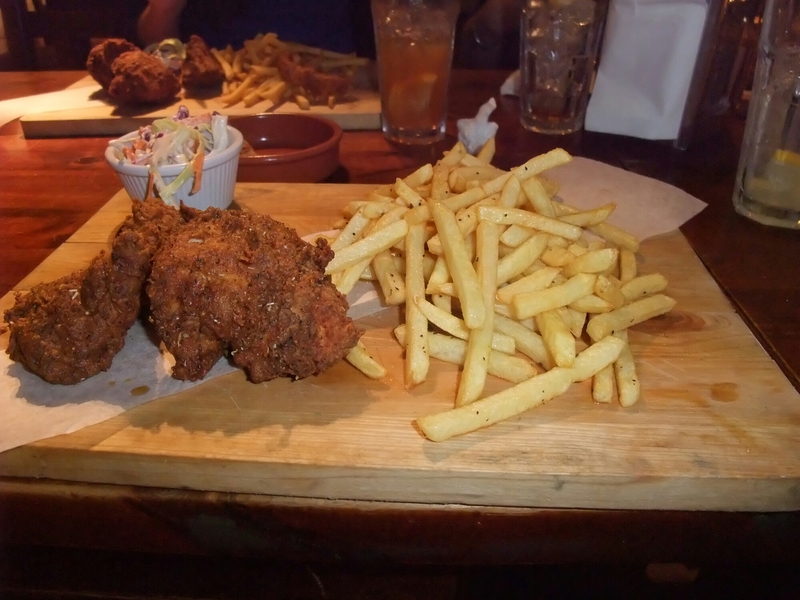 If I wanted to eat off a wooden board I would simply ask for my food to be to dumped directly onto the table! Seriously, what is wrong with a plate? Drinks wise there was a good selection of soft drinks for lunch time eaters who have to go back to work, including ice teas and homemade lemonade. I had the later which lacked the sharp citrus punch for my taste, but was pleasant enough and nicely priced at £1.50. Others had ice tea which I tasted and thought was rather nice. Looking at the picture of the bill and the drinks menu seems we were overcharged 30p each for these. Hmmm didn’t notice that at the time. Alcohol wise the menu included a wide selection of cocktails including the very worryingly named “Tender Knob” – we steered well clear of that one when ordering! No one on the table wanted to have to say on it being delivered “Yes mine’s a Tender Knob”. Made for the many hen parties that frequent Cardiff of a weekend that one. Back from the land of innuendo, the beers on offer looked quite good with some nice US beers including Brooklyn, Anchor Stream and Samuel Adams. The chicken was very good with a really nice light, crispy, well flavoured coating. It would, I think, have been even better with bone in chicken. The sides, bar from my fries, were excellent. Not sure about the burgers or the BBQ elements of the menu, but as I didn’t try them I can’t really comment much on them. 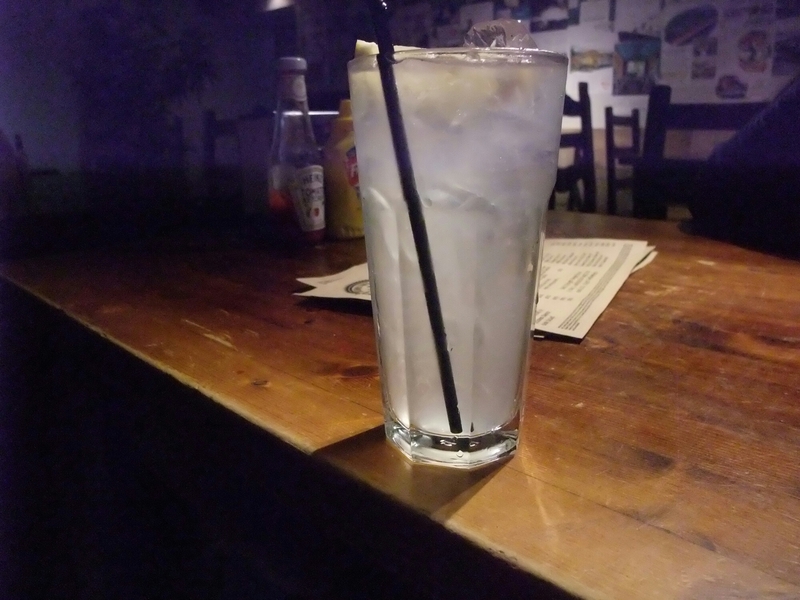 Price wise we paid around the £12.50 mark a head with a soft drink, the extra side and a tip. Not cheap for a one course lunch, but it was a good size meal so all in all about right price wise I thought. Would I go back? Niggles (as referred to above) aside, yes for the chicken, onion rings and deep fried pickles. I remain to be convinced as to the burgers, ribs and other BBQ stuff on offer and doubt would order them over the really rather good fried chicken. 🙂 took me bloody ages to come up with it. 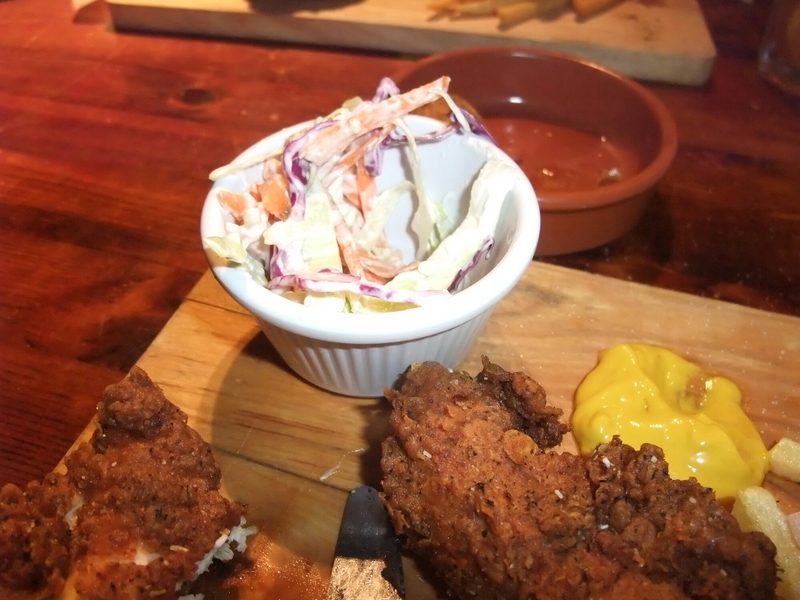 This entry was posted on Aug 10, 2014 by solicitingflavours in BBQ, Cardiff, Food, Food and wine products, Fried chicken, lunchtime, Restaurant Review, Wales.